Leafleting - Villa Guardia - Parco Commerciale downtown. Some AVP members wearing animals masks will be leafleting on a street in downtown Lisbon. Sit-in, information stand and leafleting. Information stand. Meatless meal. Panel discussion / debate. We will have a peaceful demonstration to encourage others to stop contributing to killing of animals for food and profit. "The three wise monkeys". An activist will cover her/his ears, another one her/his and the third one her/his mouth. Other activists will distribute leaflets in order to raise public awareness about the fate of animals used for food. We will be holding placards and distributing various documents concerning the abolition of meat. "Animals' tombs and butcher" street performance along with leafleting and an information stand. Public reading from the book "Faut-il manger les animaux?" from Jonathan Safran Foer's book _Eating Animals_. Fountain Bel-Air. Placards, leafleting and conversation with passers-by. Information stand with video about meat abolition, vegan meal and leafleting in the city centre. Information stand, videos and leafleting. Information stand and leafleting in order to promote the demand for the abolition of meat. On 28/01, 10am to 2pm, place Rallier du Baty, Rennes : Information stand Collectif Rennais Pour les Animaux along with DDA (Droit des Animaux) and NEA (Non à l'Exploitation Animale). Videos, leafleting, petition signing, meatless meal. Grocery stand with fake "human" meat. Information stand, leafleting, "fake blood event" with fake blood poured in the street. Public reading of a piece written by Estiva Reus. Demonstration in front of several butcher shops in the city center. Organized by the Initiative for Animal Rights of the Region of Stuttgart. We will be in front of a meat restaurant called 'l'entrecote' dressed as butchers and offering fake meat to taste. Demonstration. Information stand. Leafleting and videos of slaughtering. Projection of video clips on building facades in the center of town as well as on large screen monitors. a large screen that'll project images of farms and slaughterhouses. We will also have large panels with images of slaughter and large banners displaying anti-animal slavery slogans. Videos will be shown and a mourning event for the animals will be held in the city centre. We will also be holding placards about the realities of animal exploitation and slavery. We will be having a demonstration and handing out leaflets at an intersection that has the busiest McDonalds and KFC in San Diego. We may also pick another location and do outreach there as well (we are working on that now). from 1:00-3:00pm near the Newport Beach pier in Newport Beach, CA. 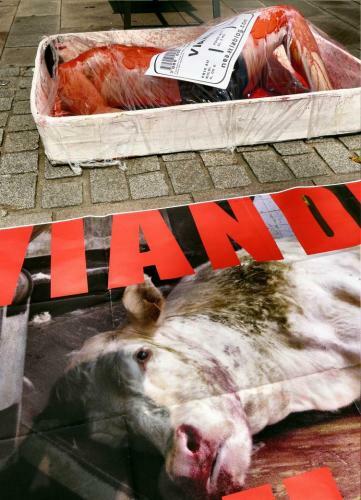 Corso Vittorio Emanuele, from 3 p.m.: some activists will silently stage the massacre of the animals killed so that meat, dairy products, eggs can be eaten.